Ok…it wasn’t orginally called, “Rock Cake”. And I didn’t make it for a birthday or special occasion. 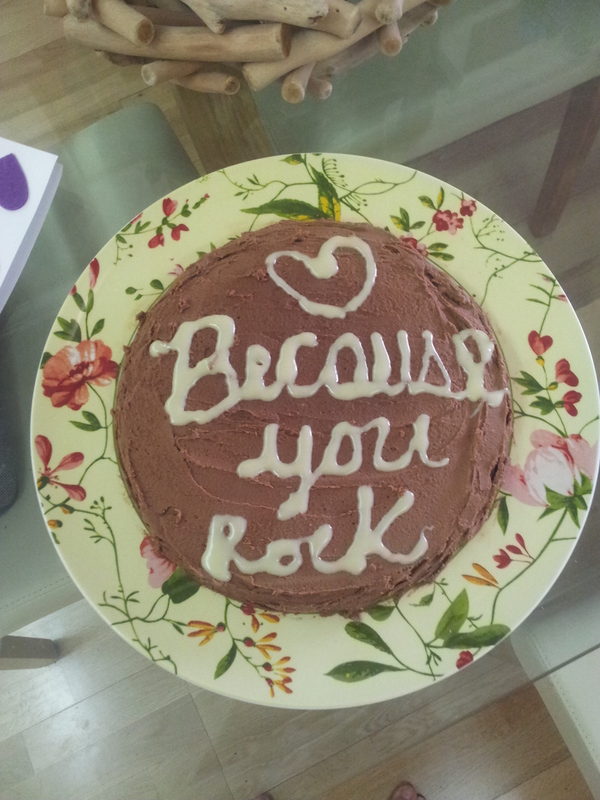 I made it because I have someone in my life who seriously rocks. He rocks because he loves me when I am at my best and at my worst. And yes, I can be great but I can also be a serious pain in the arse sometimes. But he never makes me feel bad about it. He sees the best in me when I don’t always see the best in myself. It is good idea to let people know they rock on a random day. I found this recipe in the Clandestine Cake Club Cookbook by Lynn Hill and it is originally called the Chocolate Orange Disaster Cake. Preheat your oven to 180 degrees. Grease and line two 18cm round cake tins. Beat the sugar and butter together in a stand mixer until light and creamy. Add the eggs, one at a time, and beat well after each addition, adding a tablespoon of the flour with the last egg to prevent curdling. Sift all of the dry ingredients (flour, cocoa, baking powder) together and fold into the batter, then mix in the orange zest. If the batter is too thick (ie it is not dropping consistency), loosen it with some milk. Divide the batter evenly between the two cake tins and bake in the oven for 20 minutes or until cooked through. (Note there is not much batter so don’t use larger cake tins.) Remove the cakes from the oven and allow them to cool in the tins for around 5 minutes before unmoulding onto a wire rack to cool completely. Beat the butter and icing sugar together until smooth, then mix in the melted chocolate and liqueur. Assemble the cake by placing one cake on a cake board, spread half the frosting on it, top with the remaining cake, then spread the rest of the frosting on top. Decorate. Go on…let someone know they rock. ← The ¨You will have to tell everyone about it¨ Cream of Mushroom Soup by..Julia Child of course!